New talks aimed at averting strikes by fuel tanker drivers are to be held on Monday, Acas has said. Earlier, a document intended to avert a fuel tanker driver strike, but which unions rejected, was seen by the BBC. The four-page draft agreement - drawn up by the conciliation service - covers areas such as pay, health and safety, training and pensions. The threat of a walkout returned on Wednesday when the Unite union turned down the agreement. Peter Harwood, Acas chief conciliator said, "Acas talks will reconvene on Monday. The employers and Unite have agreed to an extension of the validity of the ballot period for a further four days until Tuesday, to enable these talks to take place." Meanwhile, the union is to re-ballot members at the firm Hoyer. It is understood that some of the drivers there did not receive ballot papers for a possible strike. Because this process could take several weeks, it could mean Unite would not be able call industrial action at that company until mid-May. More than 2,000 tanker drivers at seven haulage companies were initially balloted. 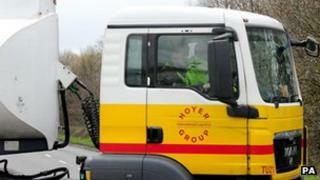 Workers at five of those firms, including Hoyer, voted in favour of industrial action. Since then, the agreement thrashed out to avert a strike has been voted down. Unite says fragmentation of the fuel distribution sector is cutting pay. The union wants a minimum rate of pay set across the industry to stop newcomers undercutting rivals as they enter the market. The document meant to placate both sides in the dispute - seen by the BBC - says employers should "recognise Unite's aspiration to establish industry-wide minimum terms and conditions of employment, including a minimum rate of pay". However, there is no commitment on the part of employers to make this happen and the document is said to be short of detail. Instead, the agreement proposes an "externally managed industry pay benchmarking exercise" to help Unite identify operators not offering what it perceives as fair pay. The document also calls for a new code of practice to be regulated under the auspices of the Health and Safety Executive. This would ensure that one standard of employers' best practice is applied across the industry. The document indicates the Department of Energy and Climate Change has also been approached to reconstitute the UK Downstream Oil Industry Distribution Forum. It is thought this would help to establish the so-called driver "passport" that Unite has been seeking - an industry standard for health, safety and driver training. On pensions, Unite says that the fragmentation of the industry has led some drivers to have as many as six different pension schemes. The agreement contains a proposal to examine options to "provide immediate pension portability and reductions in the administration costs of the scheme". It also reveals that common ground has been established on the subjects of equal opportunities, disciplinary and grievance procedures and trade union facilities. The agreement was to be reviewed by the parties in six months to see how it operated in practice. Meanwhile military drivers are being put through an eight-day training course to enable them to operate commercial tankers, should a strike be called. More than 80 drivers from the Royal Air Force have been training with one oil haulage firm.